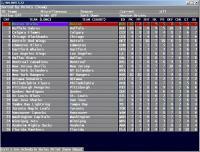 First open NHLinfo and select if you want to edit default databases or season. Teams stats should be opening there by default, if not, you can change it from left corner selecting teams as viewing mode. Note that you cannot change value on ID-column, for example in this case from TB to CL. NHLinfo dont allow that, it only shows ID. Anyhow, I dont think game show it anywhere so it actually does not matter. Save it from bottom selection of the screen. That applies to some other graphics also, which you can access with NHLinfo. Favorite Way To Score:In the locker room. I'm not sure how you are getting to the list of teams like in your first picture. When I open NHLInfo all I get is an image viewer. And when I change the directory to the game directory it only recognizes files that are graphics files. Maybe your anti-virus software is causing this? I use Avast and it somehow thinks that part of NHLinfo's dll's are "suspicious" and does just like what happened to you. Try to change your anti-virus software settings that all NHLinfo's dll's are ok to run. EDIT: Yes, Avast gives now "Win32:Evo-gen [susp]" even if I try to download it. Hmm that might be a problem if people want to dowload NHLinfo and they have Avast installed and on. I just checked all files from nhlinfo-package on www.virustotal.com and everything was clean. 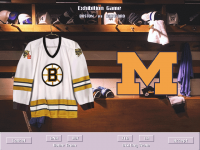 hi kiba, is there an updated version of nhl 95 anywhere on the web? 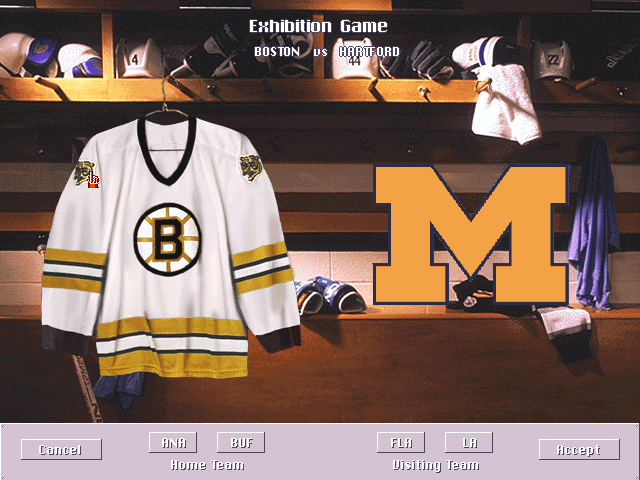 i really miss the nhl95.com site. i wonder what happened to it or the guys who ran it? The other DLL's don't have the "detected" next to them even though they are in the same folder as the gfx dll. 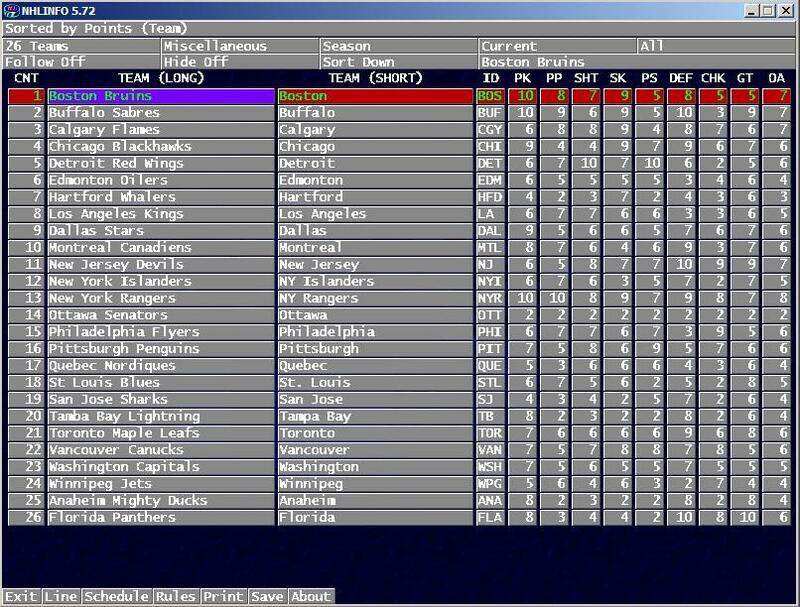 I quess people who did run nhl95.com just get tired to run their league and they didnt want to pay for a domain anymore... but I am just guessing here. goodbyeccha, wnhlinfo should be in same folder where nhl95 is installed. That is the folder where hockey.exe is. Wnhlinfo "see" only that one nhl-game, which installation folder it is copied. For example, if you have other EA nhl-games which wnhlinfo supports, like nhl96, you have to put wnhlinfo and all dll's also to nhl96 installation folder if you want to edit nhl96. I hope this is simpy problem in your case. 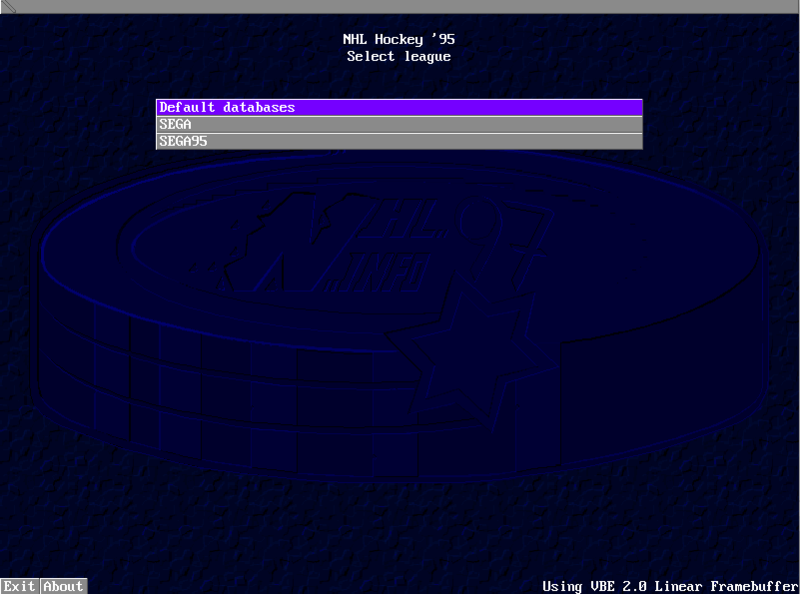 Another thing what you can try is install nhl95 in "simple" directory because dos supports only 8 char in directory names. 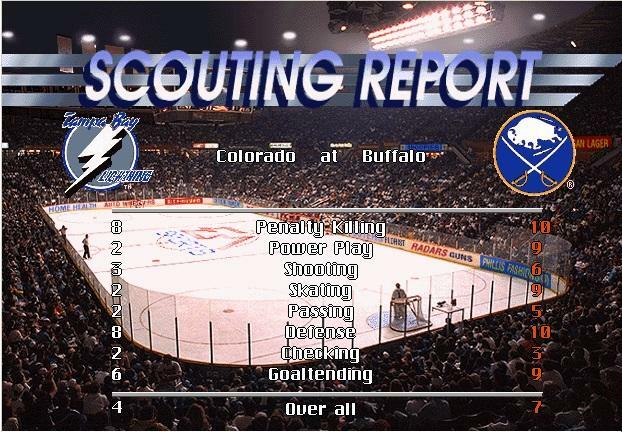 For example D:\nhl95. Understood. I will try that tonight to see if it fixes my problem. Awesome, works perfectly now. Do you know how to change the name in the exhibition select screen? I've got it changed in the edit lines and the scouting report but I can't figure out to change it on the jersey select screen. I found some things. 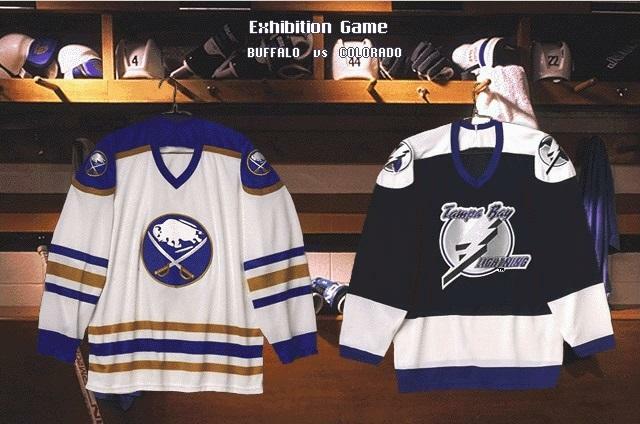 On Exhibition team selection screen, team name (over the jerseys), Tampa Bay is located in hockey.exe on address: 1079360. All other teams are near there. You can see that TAMPA BAY is now COLORADO. Also, from sports central, menu selection Game->Game, team shortening is stored in TB's case on address: 1079149. All other teams are again near there. I put CL there, not COL, because there is very likely some kind of checksum and size of the hockey.exe should not change. Fantastic! I've looked through every file with a hex editor but never thought to look in the executable file itself. Thanks! Hi, how to get NHLinfo? What it comes to make new rosters and update game graphics of NHL95PC, we do not have very large "community" here. 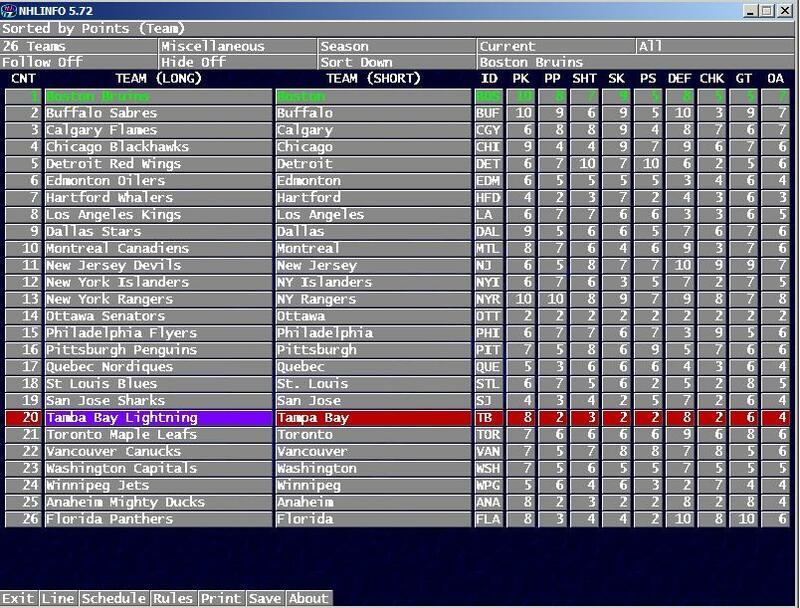 Only few people are interested to do this kind of stuff, mainly because most of the people are focusing more to NHL94. 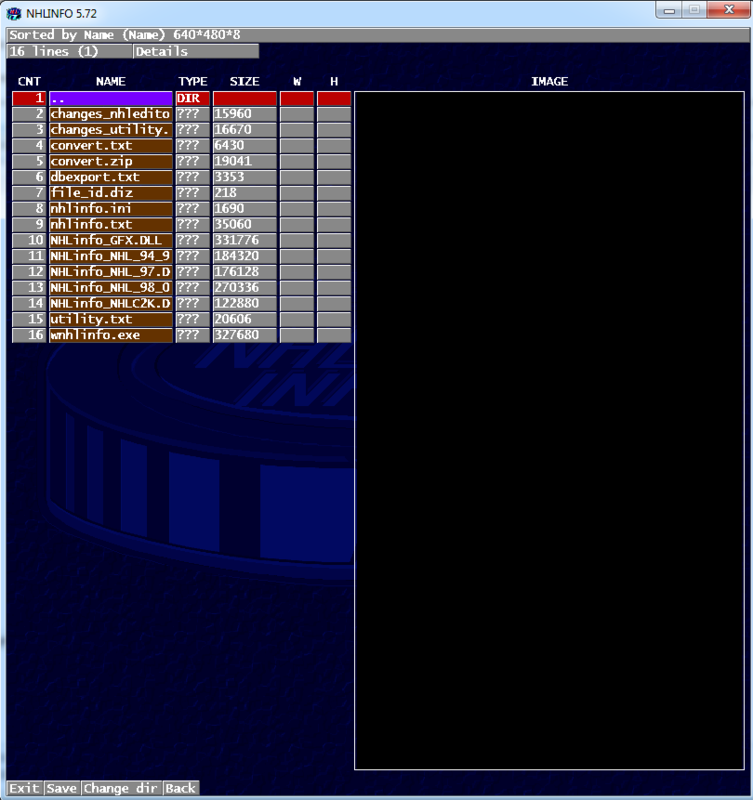 Learning the tools and do the actual work for rosters, graphics and conversions will take lot of time and effort. You are not dumb. You can be lazy like me, but you are not dumb. This is not something you will learn in one day if you starting without experience. Take time for it, if you can and you will make it eventually. You can try to ask someone to do rosters for you, but I think eventually you have to do your own work. Here are updated rosters and jerseys petrmaly13... I'm in this topic to learn how to change the team names. Hopefully I'll have that done soon. Changing the team names is the easy part.. the logo changing part is going to be a process it seems. How did you get to this screen? Instead of pressing a game to load. Press the View all kinds of images which is the first option. My only option is to select a save file. I'm using the DOS version if NHLInfo. I'm assuming that the features depicted here are exclusive to the Windows version. If that's the case, then I'll need some help with a mod I'm trying to make. 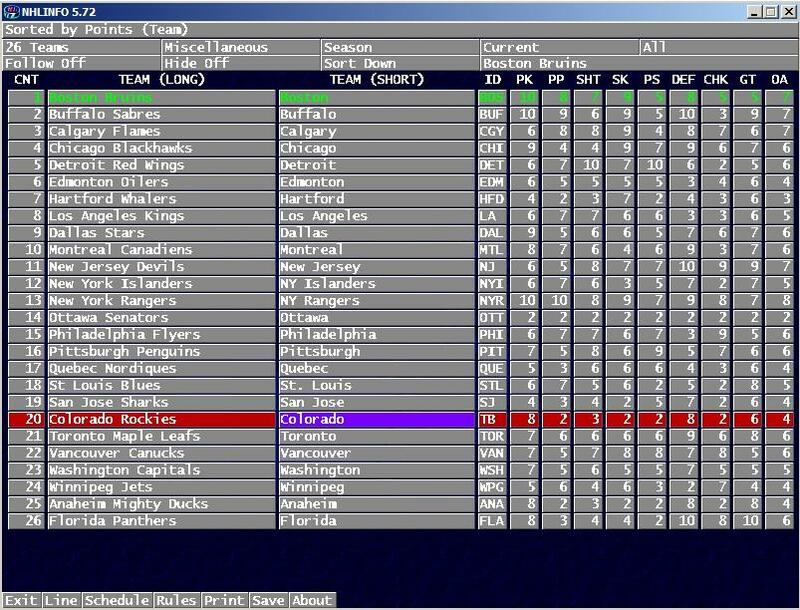 So, that's the first screen when you start NHL Info? Not after you select the game. Yes. Like I said, it's the DOS version I'm using. If that is the case. You are SOL until you get the Windows version. Answered to this problem already on other thread, but GFXPAK will not work with dos version of nhlinfo. So, use wnhlinfo. For that, it seems that you need get a computer with Windows OS. Yeah, but I don't think my parents will let me.